The tetanus titer checks for tetanus antitoxoid antibodies in the blood to help assess tetanus immunity. What is a tetanus titer? A tetanus titer checks for tetanus antitoxoid IgG antibodies. Why is a tetanus titer important? A tetanus titer helps assess tetanus immunity from prior vaccination. This Tetanus Titer is a blood test. The tetanus titer, sometimes known as a tetanus immunity test or a tetanus antitoxoid antibody titer, measures tetanus antitoxoid IgG antibody blood levels. Tetanus is an infection caused by the Clostridium tetani bacteria. Known as lockjaw, tetanus can cause horrific muscle spasms that begin in the face and jaw and spread from there. In addition to violent spasms, people with tetanus can also have fever, sweating and other symptoms, typically within one week of exposure. The tetanus titer is frequently ordered to assess one's immunity to tetanus for compliance requirements in conjunction with the hepatitis B titer, MMR titer and varicella titer tests by students and healthcare workers. To get a tetanus titer near you, order online and get tested at the Quest Diagnostics lab that you selected. 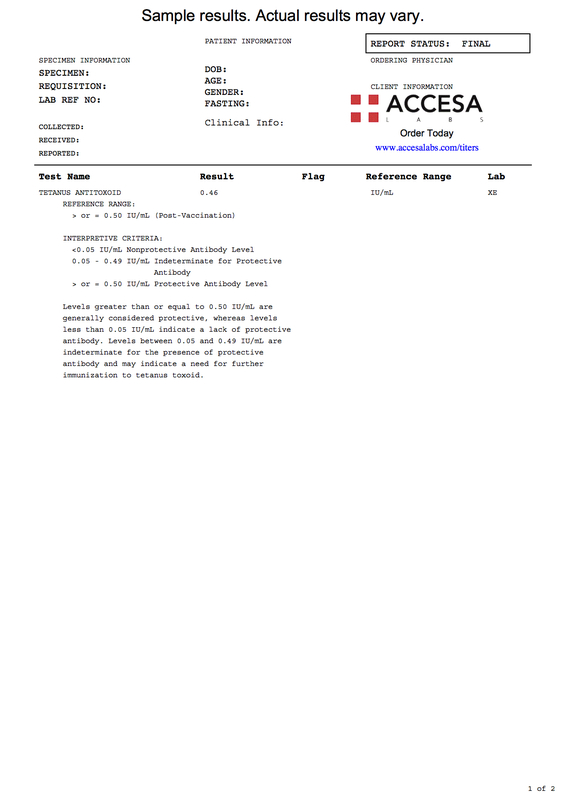 Once your tetanus lab test report is ready, it will be available for download. As can be seen on the sample tetanus lab report above, the components of the tetanus will report quantitative IgG antibody blood levels (i.e. numerical values) which can be compared against the reference range provided by the lab. Interpreting tetanus titer test results is not too difficult. In reviewing the tetanus antitoxoid sample lab report provided above, one can see a result of 0.46 IU/mL reported as the tetanus antitoxoid antibody concentration. That lab result is considered indeterminate when compared against the interpretive criteria provided by the lab. Indeterminate results typically mean that one needs to be revaccinated with the Tdap vaccine although one could consider repeating the tetanus titer to confirm the result. Tetanus antibody levels below the indeterminate range are considered nonprotective meaning that revaccination is needed. Tetanus antitoxoid antibody levels above the indeterminate range imply that the antibody levels are protective and confer adequate immunity to tetanus. People interested in checking their immunity to tetanus and diphtheria, a related infectious agent, should consider getting the tetanus & diphtheria titer. For a wider test that checks for pertussis immunity, the Tdap titer is recommended. Tetanus Titer at Guaranteed Prices.